Naval Submarine Base Kings bay is located in St. Marys, Georgia, a short distance from Jacksonville, Florida. 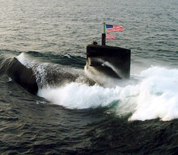 The base serves as the US Atlantic Fleet home port for ballistic missile nuclear submarines armed with Trident missile nuclear weapons. Units stationed at Kings Bay include Submarine Group 10, Submarine Squadron 16, Submarine Squadron 20, the Naval Submarine Support Center, the Strategic Weapons Facility Atlantic, Marine Corps Security Force Battalion, the USCG Maritime Force Protection Unit and the Trident Refit and Training Facilities. There are also two guided missile submarines and six ballistic missile submarines homeported at the base. St. Marys Historic District was listed on the National Register of Historic Places in 1976. There are several buildings of the 18th-century town that still exist today. The city also serves as the gateway to the Georgia Coast's barrier islands and the Cumberland Island National Seashore. The St. Marys Submarine Museum is located on the waterfront and houses exhibits showcasing the history of submarines in the area. This St. Marys Naval Base directory features the critical info you’ll need to navigate through the many facilities and recreational opportunities available on base.